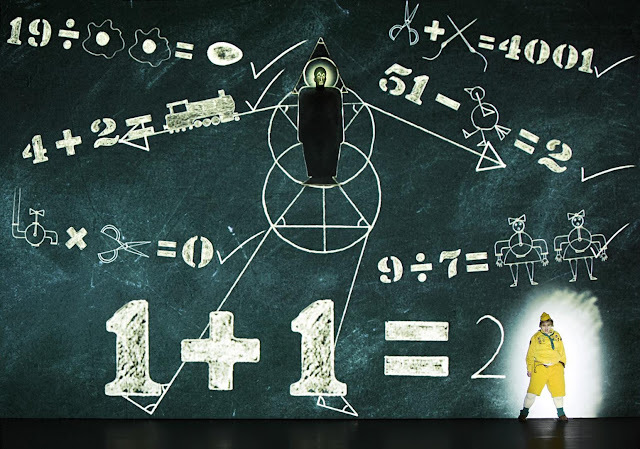 1927’s Magic Flute has been well-nigh universally lauded, both at the Komische Oper and subsequently on tour. I say ‘well-nigh’, since I felt more ambivalent, applauding some aspects of the reworking, whilst lamenting a lack of seriousness at its heart: for me a perennial problem with many stagings of that work. Maybe I was not in a very good mood, or maybe the combination of æsthetic and work was just not for me; maybe I missed the point. Or perhaps I was right: who knows? I am not terribly easy to please when it comes to Mozart. At any rate, I am delighted to welcome its successor, a double-bill of Petrushka and L’Enfant et les sortilèges. Petrushka is 1927’s first completely non-verbal work, and, of the three I have seen, I think it comes off best of all. (A counter-argument might be that I know less of ballet than I do of opera, but I should like to think that I know a little about Stravinsky, at least.) Here we see it via the offices, once again, of Paul Barritt’s animation – and with three humanised puppets: Petrushka as ‘awkward clown’, alongside a ‘sensitive acrobat’, Ptitschka, and an ‘unrefined but good-natured muscle-man,’ Patap. 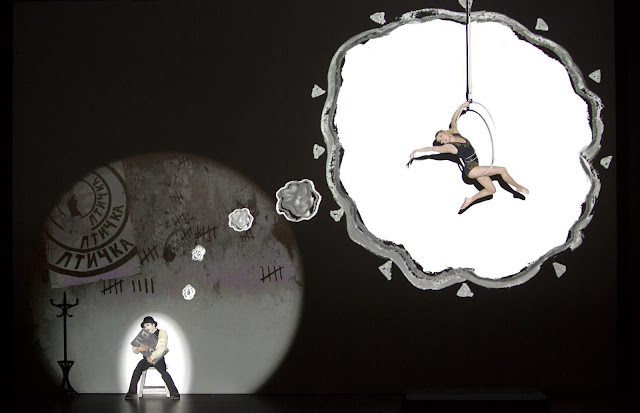 The animations are a period-influenced, but not period-restricted, delight: from a little later than the writing of the work, as the company’s name, ‘1927’, might suggest. 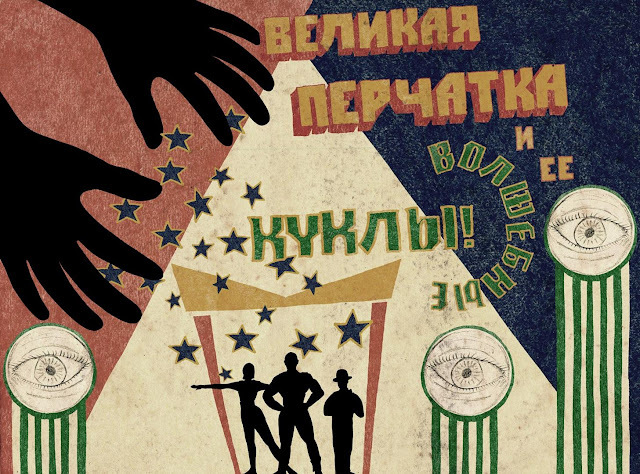 Russian constructivism and the world of silent films more generally loom large. Colours, aptly, are gloriously bright (even if the curmudgeon in me might have wished for the original score rather than the more ‘practical’ 1947 revision), yet monochrome plays its part too. 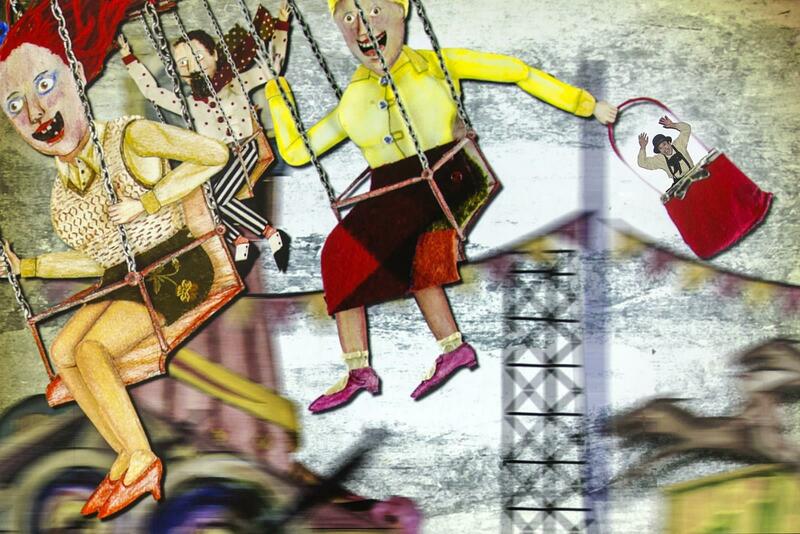 We tumble headlong – not unlike Petrushka himself, a little later – into the world of the fairground. ‘Roll up, roll up,’ the Russian speech-bubble (thank goodness for the Komische Oper’s multi-lingual titles) beckons us; it really felt to me as though we were making an individual and collective decision to attend the show within a show. That show is beautifully presented, not only showing but dramatising a keen sense of the thin line between comedy and tragedy. Puppet shows have always done that brilliantly, or at least the best ones have, so why should not a multi-media reimagining of the format, a work about puppetry? Petrushka is the latter anyway, of course, and here the figure of the puppeteer looms large – not visually, although his (I think we can presume ‘his’) actions certainly do. The heartlessness with which Petrushka is toyed with – which yet endears him to Ptitschka, and indeed also elicits sympathy from Patap, following his necessary moments of self-display – moves us, as does the excellence of the onstage performers, seemingly effortlessly moving between the worlds of stage and film. The sad clown, for Barritt close to Buster Keaton, and dressed as such, is not for nothing one of our culture’s perennially recurring figures. He lacks the grace of Ptitschka, the physique of Patap, but he is human, he feels sadness even when, particularly when, he amuses us. The manipulator of his emotions – the puppeteer, that is – does not entirely succeed in manipulating ours. As for the other manipulator, the composer who so notoriously declared music’s inability to express anything other than itself, his score in performance exuded colourful rigour, its opening nicely, intriguingly deliberate, as if the forces were limbering up yet undoubtedly in control. Like what we saw, what we heard sounded audibly ‘Russian’ in origin and spirit, but with some degree of distance from time to time as well: not unlike Stravinsky, one might say. A few minor frayed edges aside – one can readily forget what a difficult piece this is – the orchestra under Markus Poschner did it proud, reminding us that recreation is not simply a matter of a new production; it happens, or should happen, every time we play and hear Petrushka. 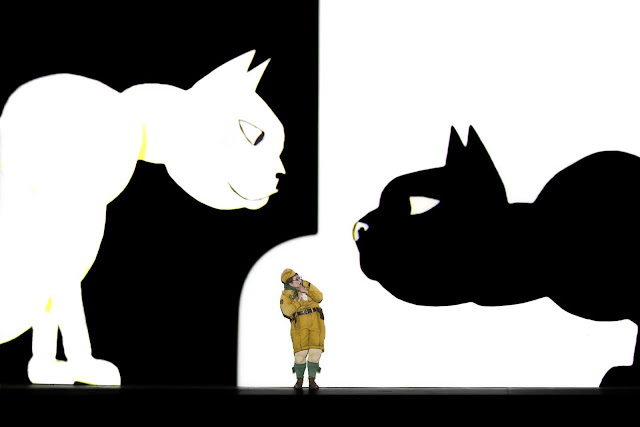 In a programme interview, Suzanne Andrade likens the figure of the puppeteer in Petrushka to that of the Mother in L’Enfant et les sortilèges. It makes for a good connecting motif: meaningful rather than merely neat. It also helps make the ‘moral’ of Colette’s story – I think Ravel remains more circumspect; does he not always? – both more explicit and open to question. (Perhaps it criticises itself anyway; I am genuinely not sure. If so, that tendency is stronger here.) Andrade says that she and her collaborators had originally intended the boy (sung by a woman, let us never forget) to be like ‘one of those upper-class boys from Great Britain … they are naughty and learn nothing from the experience, because the societal status quo is such that they need not learn anything.’ If those overgrown schoolboys (and their aspirant hangers-on) have ‘had enough of experts’, we, not least those of us recently pushed into exile, have had more than enough of their running amok with our lives and futures; it is therefore something of a relief to experience contrition and forgiveness, before asking ourselves: ‘but whose, and on what authority?’ Who is the Mother, whether personally or more broadly, and what does she intend to be the outcome of those trials through which she means to get her own way? The visual inspiration here comes from comics and films involving naughty little boys. Andrade names Dennis the Menace and the American film series, Our Gang (which began in the 1920s). Again, the transitions between animation and staging are deftly, wittily presented. (They also help with doubling or tripling of parts: one need not always see the singer in costume.) If I did not feel that as much was added to my thoughts about the work as in Petrushka, beyond that intellectual and dramaturgical question of overarching agency, perhaps I am showing myself a little more resistant, as I suggested, in opera than ballet (if, indeed we consider Stravinsky’s work primarily as such). Perhaps I also missed the nostalgia evident in Ravel’s sophisticated conception of childhood: no child could or would ever think of its ‘hood’ like that. One might counter that the score is there to do that anyway. The Komische Oper’s welcome change of language policy – are you listening, ENO? – meant that we did not have to hear Ravel in German. If not everything was delivered with the most assured sense of what we have come to accept as French style, it rarely, or never is, even with Francophone singers. Moreover, one could hear every word – which is not always the case with such singers. Nadja Mchantaf made for a splendidly tomboyish boy – if that makes any sense. As hapless and as clumsy as Petrushka, he will at least have another chance. (Those privileged boys always do.) Orchestra and conductor seemed – or perhaps this was just my imagination, given the context – to play the score as if informed by some Stravinskian elements, rhythm perhaps playing a more prominent role than harmony at times, although such hierarchies will always be a matter of degree. In keeping with what we saw, there was much in bright, primary colours, and an evident delight in the mastery of that ‘Swiss watchmaker’, as Stravinsky called him. The rest of the cast proved very much more than the sum of its parts. If I do not relist the singers, it is not out of disrespect, but at least in part to emphasise, as so often in this house, the nature of the achievement of the company in an emphatic sense.